CANMORE, ALBERTA—Canada—Pump up the adventure, and excitement, with our two river tour! 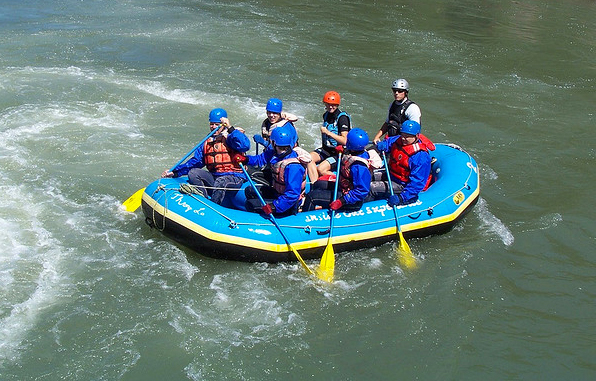 Experience the thrills of the Kananaskis River and the Bow River, all in the same day! Warm up with a ride on the Kananaskis River, over Class I to Class III man-made & natural rapids. With the slower pace here, you’ll have plenty of time to take in the natural beauty of the Kananaskis Valley as you surf and paddle here. If you’re feeling brave, hop in for a quick swim in the glacier-fed water. After a picnic lunch and a quick shuttle ride, you’ll arrive in Horseshoe Canyon. Look around you: 200 canyons add to the stunning scenery of this area. Cliff jumping is also available (depending on the water conditions). This two river tour is a must for anyone looking to spend more time on the whitewater during their Canmore-Kananaskis rafting vacation.